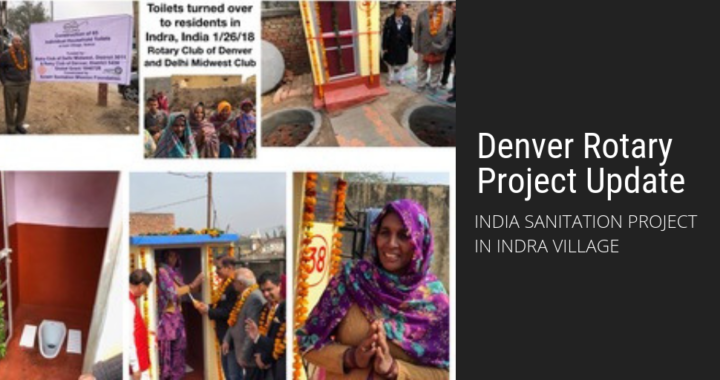 This morning we received notification from The Rotary Foundation that our Final Report for GG#1640728 – India Sanitation Project in Indra Village – has been officially accepted and all project activities now successfully completed. People in the village live in the most deprived conditions of ignorance and poverty, completely unaware of their potential. In spite of being very near the capital of the country and having high potential for spiritual tourism, the village lags behind in almost every stream of development. Most of the people are still living below the poverty line and their education level is very low. It was found that open defecation is very high and overall sanitation conditions in the area is poor. Toilets are seldom found in the houses. Healthcare is not easily accessible because doctors seldom visit the community. There is urgent need for hygiene promotion. Health and hygiene promotion are required to enhance the health standards especially those of the women and female children. The objective of the project was to build 65 toilets for residents and conduct hygiene training and awareness in the surrounding community. We actually were able to construct 67 toilets – see attached photo. During the community celebration of the completion of the 50th toilet, members of the Delhi Midwest were moved to personally donate another 55 toilets for a total of 120. This directly affected over 800 people and influenced many times that number. 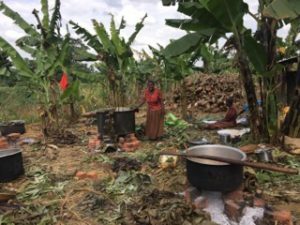 It has been found that once families have toilets, others in the community are determined to get one of their own. This multiplier effect is difficult to quantify. Many thanks to the Rotary Club of Delhi Midwest for all their hard work to bring the project to a successful conclusion, especially Ashok Jain and Sunil Kapoor. We also appreciate the generous funding from your club to make this happen. We appreciate it as do the people from the village of Indra, India. 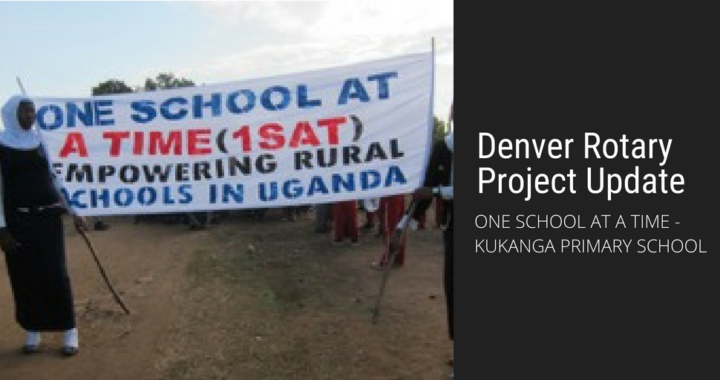 You are receiving this update as you donated over the past few years to the construction of a 5 classroom block building at Kukanga Primary School, rural Uganda (One School at a Time partner school #2). 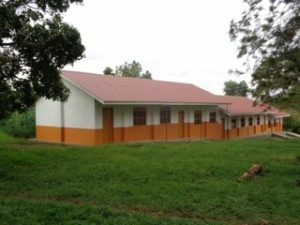 I wanted to share with you about the completion of these classrooms and our celebration this July 4th to commemorate just that! 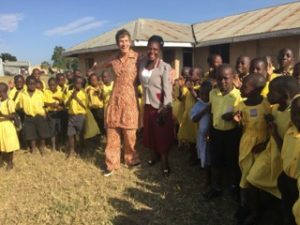 Patty Gilbert and I, co-founders One School at a Time, woke at our Ugandan field office on that day at 7 AM to hear a huge commotion outside. We looked out the window, surprised to see a marching band (complete with tubas, horns, a drum and cymbals) along with over 500 student representatives from the 5 One School at a Time partner schools. Little did we know, but they had planned a musical marching parade…..and we were the guests of honor! We rushed outside and were swept into the fold as we marched in synch the 5 miles of dusty roads between our field office and Kukanga School. 100’s of onlookers lined the streets as the joyful procession snaked its way along. 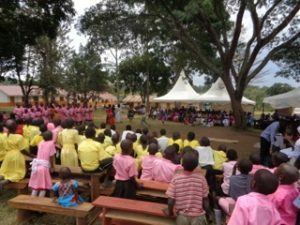 When we arrived at Kukanga School, the head teacher hurried us to the girl’s washing area admonishing us to bathe and put on new clothes. 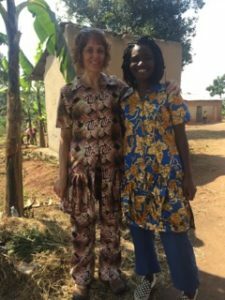 Turns out the new clothes she provided had been hand-sewn by Agnes, the head teacher of Bbinikila school, another One School partner. Patty and Juliet’s (Bays’ daughter) clothes fit perfectly but Bay’s were too small in the shoulders. Next stop was the ceremony, attended by over 1,000 community members- parents, students, teachers, administrators, local government officials, church officials and a few reporters from local and national newspapers. 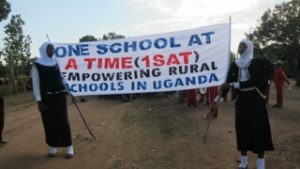 After student dances, head teachers from each partner school summarized the changes that had occurred at their schools since partnership with One School at a Time. 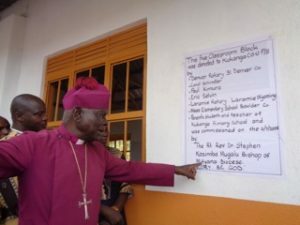 The finale was a raucous and controversial speech (encouraging parents to beat their children) by the Bishop of Mityana Diocese, followed by the offical “launching” of the new classroom building. 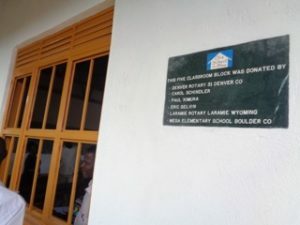 Earlier, the Bishop had communicated with Hussein Tadesse, One School Program Manager, that the original plaque thanking the donors (that would be all YOU wonderful people) was NOT acceptable and that the Diocese needed to be acknowldeged (even though they had nothing to do with the project). Eager to comply, Hussein simply made a new sign that covered the original plaque. This skillful solution assuaged all the egos. 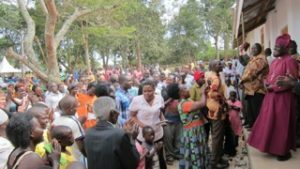 After the “launch”, all 1,000 attendees were fed a traditional meal of matoke, rice, meat and sauce. Upon our exhausted return to the Field Office that night, a knock came at the door. Agnes (photo below) had arrived! After a rigorous day of marching, speech-giving, and organizing and managing a giant celebration, she was there to measure Bay’s shoulders! As promised, the next morning like clockwork she arrived to deliver Bay’s outfit, now tailored to fit perfectly. Thank you so much for being part of this wonderul and worthwhile effort. We could not have achieved all this without your loving support.